Climate reconstruction aims to reconstruct a consistent record of the Earth's climate dating back to thousands of years. By understanding the long term history of Earth's climate, scientists can explain and project the planet's current and future climate trends. Scientists usually drill for sediments which can reveal the past state of the Earth's climate. The new method of using studying algal deposits on the ocean floor is similar to the practice of using tree rings to track the passing of the time. With algae, these "rings" can be as small as 30 microns. Scientists study the magnesium levels in these layers which is dependent on the amount of sunlight and water temperature. 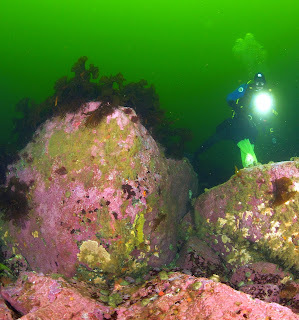 Past climate data only goes back 150 years but with the new method of using coralline algae, this record can go back to the life span of the algae which is more than a thousand years. Almost 650 years of annual change in sea-ice cover can been seen in the calcite crust growth layers of seafloor algae, says a new study from the University of Toronto Mississauga (UTM). "This is the first time coralline algae have been used to track changes in Arctic sea ice," says Jochen Halfar, an associate professor in UTM's Department of Chemical and Physical Sciences. "We found the algal record shows a dramatic decrease in ice cover over the last 150 years." With colleagues from the Smithsonian Institution, Germany and Newfoundland, Halfar collected and analyzed samples of the alga Clathromorphum compactum. This long-lived plant species forms thick rock-like calcite crusts on the seafloor in shallow waters 15 to 17 metres deep. It is widely distributed in the Arctic and sub-Arctic Oceans. Divers retrieved the specimens from near-freezing seawater during several research cruises led by Walter Adey from the Smithsonian. The algae's growth rates depend on the temperature of the water and the light they receive. As snow-covered sea ice accumulates on the water over the algae, it turns the sea floor dark and cold, stopping the plants' growth. When the sea ice melts in the warm months, the algae resume growing their calcified crusts. This continuous cycle of dormancy and growth results in visible layers that can be used to determine the length of time the algae were able to grow each year during the ice-free season. "It's the same principle as using rings to determine a tree's age and the levels of precipitation," says Halfar. "In addition to ring counting, we used radiocarbon dating to confirm the age of the algal layers." After cutting and polishing the algae, Halfar used a specialized microscope to take thousands of images of each sample. The images were combined to give a complete overview of the fist-sized specimens. Halfar corroborated the length of the algal growth periods through the magnesium levels preserved in each growth layer. The amount of magnesium is dependent on both the light reaching the algae and the temperature of the sea water. Longer periods of open and warm water result in a higher amount of algal magnesium. During the Little Ice Age, a period of global cooling that lasted from the mid-1500s to the mid-1800s, the algae's annual growth increments were as narrow as 30 microns due to the extensive sea-ice cover, Halfar says. However, since 1850, the thickness of the algae's growth increments have more than doubled, bearing witness to an unprecedented decline in sea ice coverage that has accelerated in recent decades. Halfar says the coralline algae represent not only a new method for climate reconstruction, but are vital to extending knowledge of the climate record back in time to permit more accurate modeling of future climate change. Currently, observational information about annual changes in the Earth's temperature and climate go back 150 years. Reliable information about sea-ice coverage comes from satellites and dates back only to the late 1970s. "In the north, there is nothing in the shallow oceans that tells us about climate, water temperature or sea ice coverage on an annual basis," says Halfar. "These algae, which live over a thousand years, can now provide us with that information."